Update: 43Rumors.com is reporting that Olympus has only extended the current PEN-F name registration and any new camera will be first registered by Olympus with the “IMxxx” code first before it gets updated with the real name. 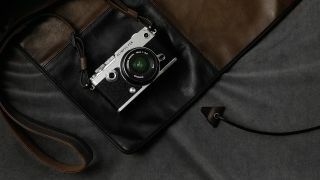 2018 was a quiet year for Olympus, but we're expecting to see a bit more activity from the company in 2019. There are already rumors (and numerous leaks) that suggest we could see a new flagship OM-D E-M1X this year, and now it seems we could also see a replacement for the ageing PEN-F.
PhotoRumors.com is reporting that Olympus registered a new PEN-F camera with an overseas government regulator – a key indicator that a new camera is waiting in the wings – but no other information is currently available. A new PEN-F makes sense though – the current PEN-F was launched back in January 2016 and is now three years old, and ripe for an update. The PEN-F is a well-featured camera, with a 2.36 million dot electronic viewfinder, 1.04 million dot 3.0-inch tilt-angle touchscreen and 5-axis image stabilization system. An uprated Micro Four Thirds sensor would be welcome though, and while we wouldn't expect a jump from the 20MP resolution, improved high-ISO performance would be nice to see, along with 4K video capture – the current PEN-F can only shoot at 1080p. An overhauled focusing system would also be welcome – the contrast-detect AF system in the current PEN-F is solid but not remarkable, and a new hybrid system with on-sensor phase-detect AF would certainly appeal.